My friend and I fly to Denver for hiking, biking, and elk viewing in the Colorado Rockies. As usual, the hiking is breathtaking. We hike the Audubon Trail (we get caught in a snow storm in the middle of summer!) Mt. Audubon is 13,223 feet high, which we hike to the summit. We also hike the extremely impressive Bear Lake Trail, which has a lot of snow and ice (treacherous!) on it when we are there in October. Great sites included The Loch, Mirror Lake, Alberta Falls, and Bear Lake. The elk are in rut at Rocky Mountain National Park (we drive the breathtaking Trail Ridge Road, which gives panoramic views of the park from a road that winds through the middle of the park), and the males are herding their harems with this strange, high-pitched, reedy bugling sound. Very interesting. In Boulder, we drive up Flagstaff Mountain for a great view of Boulder Valley, go biking on the very enjoyable Boulder Creek Path and the extremely challenging and very technical Walker Ranch Trail. I mountain-bike this trail with an elementary school friend who I learn, while in Boulder, now lives in the City (I had not seen her in over 20 years). It is admirable, while in downtown Boulder, to see bike parking facilities attached to parking meters and a little sign that said "Bicycles Park Free"
While there, we stay at the palatial home of an old high school buddy, who generously lets us stay at his place, and now lives in the Boulder foothills. 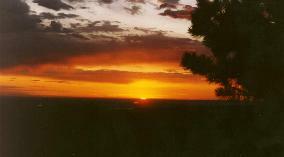 Each morning, we awake to a spectacular sunrise over the valley (see photo). From the eastern plains westward through the highest Rockies, Colorado's terrain is diverse, fascinating, and spectacularly beautiful. It is the highest state in the U.S. (It has, for example, 53 peaks above 14,000 feet.) It became a state in 1876. Colorado produces more tin, molybdenum, uranium, granite, sandstone, and basalt than any other state. The plains provide good grazing areas, and agricultural lands for several crops. In 1994, 3,656,000 people lived in the state.